Welcome to the Kasper Electrical website, we are the go-to resource for electrical services Lantana, Florida. This is a fantastic place to live, and we greatly value the many long-lasting relationships that we have developed with members of this truly unique Palm Beach County community. We have been the licensed electrician that people in this area have been turning to for well over 35 years, and we are not slowing down any time soon, because we are a next-generation family business. From Town Center to Dixie Highway to East Lake Worth Avenue, we are the electrical contractor that you can always rely on for quality service at affordable prices. 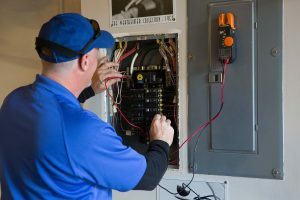 There is a very vibrant business community in Palm Beach County, and every enterprise is going to need a reliable commercial electrician from time to time. We can handle any and all commercial electrical projects, and we have the equipment that it takes to access areas that are hard to reach, like parking lot light poles. We can provide electrical repairs, upgrades, and retrofits, and we can also be engaged if you are looking for a Lantana, Florida electrical contractor to take on a new construction project. Our electrical services extend to the residential realm as well. Any time you need a home electrician that you can rely on for electrical repairs, we will be just a phone call away, and we pride ourselves on our prompt responses to emergency calls. Here in South Florida, outdoor lighting can have an extraordinary effect, and we are landscape lighting specialists who can transform the exterior of your property. Plus, in this part of the country, hurricanes and severe storms can cause power outages, and this is an annual source of concern. A home generator can provide you with peace of mind, and we have a great deal of experience installing backup generators of all kinds for area homeowners. As master electricians, we take the work that we do in the field very seriously, but we never could have stayed in business for so long if we did not provide excellent customer service from the initial point of contact onward. If you have any type of project that will require the services of a Lantana, Florida commercial electrician or a residential electrician, or if you need electrical repair work done, we will always be standing by to help. You can reach one of our knowledgeable consultants right now if you give us a call at 561.285.8036.